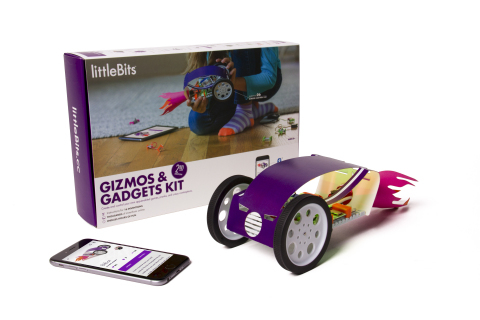 is available online at littleBits.com and on store shelves for $199.95. and a fully integrated app experience. Bubble-Blowing Bot: Make a machine that blows bubbles for you. of your phone or tablet. DIY Arcade Game: Invent a game that puts a new spin on pinball. wirelessly from the camera on your phone or tablet. product design engineer based in New York City. Development Kit, Arduino Coding Kit and more. All images and videos can be found at littlebits.cc/kits/gizmos-and-gadgets-kit-2nd-edition. Mechanics. To learn more, visit littleBits.com.